Everyone knows that everyone farts. But that doesn’t make it any less embarrassing to let it rip in public. It’s even worse if you keep going like a machine gun. Or smell like poison gas. So in order to save yourself and your friends, the question is: how do I stop farting? It’s basically gas passing out of your digestive system from your behind. As aforementioned, it’s definitely a normal thing. The average ranges from 5 to 15 farts per day. When you eat or swallow, you also ingest some air. This collects inside your body. Gases also build up during digestion. Your body can get rid of this through two openings—your mouth or behind. The second choice results in farts. Too much farting has two main reasons: swallowing too much air and your diet. Things are worse when you fart excessively and they smell horrible. Farts are mainly made up of gases such as carbon dioxide, hydrogen, methane and nitrogen. These are odorless gases. Add on the fact that you release these gases in small amounts. You won’t even notice half the time! When it does smell, it’s because the fart includes smelly gases. Such as hydrogen sulfide. These foul-smelling gases are produced in your intestines when you eat food containing sulfur. These foods include cheese, eggs, meat, broccoli and more. Unfortunately, you can’t cut sulfur out of your body. It’s needed in essential functions. Important ones like insulin regulation and metabolism. These could be signs that you have other health problems. Such as irritable bowel syndrome (IBS). You may need to go through investigations such as a blood test. You can’t get rid of farting. But you can definitely control it and reduce the occurrences. Here are some possible causes behind your toxic gas. Google things on losing weight or getting a flat tummy within 2 weeks. You will find tons of articles telling you to eat more veggies. But sadly, as aforementioned, the side effect can be noxious gas. Cruciferous vegetables, such as broccoli and kale (a health superfood) is full of dietary sulfur. Eggs are the biggest source. Fibrous foods, such as beans and legumes, help clean your digestive tract because they’re hard to digest. And because of that, our gut bacteria have to digest them instead. And they produce gas as a result. Whole wheat is often touted too. Yes, it’s super healthy. But it gives your stomach and intestines a hard time. Start with smaller portions. Experts recommend starting with one or two servings at first. Then if your body can handle it without the excessive farting, you can up the intake a bit. But even then, increase your serving size slowly. Carminative is a great addition to your meals too. These are herbs that prevent formation of gas inside your digestive system. Some great sources are ginger, celery and dill. You can also find over-the-counter supplements. Iberogast is a great option that combines 9 different carminative herbs. As for starches, rice is much easier to break down than whole wheat! Wow, what is this with healthy foods and farting? Well, some healthier or non-caloric alternatives to things can sometimes make things worse. Take margarine and butter, or Coke zero and regular for example. In the case of sugar, non-caloric sweetener is not healthier. And just like fiber, your body can’t break down these artificial sweeteners either. So in comes your gut bacteria. And out comes a smell that is the opposite of sweet. Consider switching back to natural sugar too. Just don’t go overboard with it! Dairy products are great—at producing unbearable farts. Though we survive on breastmilk when we’re born, a large majority of adults are actually lactose intolerant. Around 65% is the number, in fact. But chances may be higher depending on your race and genes. As you age, you start losing the enzymes that digest lactose. Eating a whole block of cheese may have been delish when you were a kid. But a piece or two might make you gassy now. Make sure dairy is the reason for your sour farts. Go dairy-free for a week and slowly bring it back. If the farting problem comes back, you can cut cheese and milk out of your diet entirely. Or take lactase supplement with your dairy-rich foods. It will help your body break down the lactose. Food allergy reactions aren’t always as crazy as hives or asphyxiation. They can include excessive farting too. And you can be allergic even without being diagnosed with the corresponding disease. You usually become gluten intolerant if you have celiac disease. But the National Institutes of Health once performed a study on these NCGS (non-celiac, gluten-sensitive) people. The group that ate gluten experienced bloating and constant farts. Another chemical that leads to gas is fructose. You can have fructose malabsorption. Just like how you can be lactose intolerant. Both fructose and lactose can’t be digested and come out of you with farts. Check out a low-FODMAP diet. FODMAP includes sugar alcohols and short-chain carbs. It cuts out a whole lot of foods. Say goodbye (temporarily) to processed meats, gluten, high-fructose fruits and more. This can help you figure out what causes your nonstop farts. You can also visit your gastroenterologist for testing. They can help you discover what your body may be intolerant to. Antibiotics kill bacteria to clear up nasty infections. They’re great at their job. But they can also mess with friendly bacteria. Such as the aforementioned bacteria in our guts that help break down food. If you experience these signs, talk to your doctor. Ask if it’s possible to be taken off antibiotics. If the symptoms are not as severe, consider waiting until the end of your prescription. Be patient as your gut heals and see if that remedies your gas problems. And remember not to take antibiotics for too long. Make sure to follow your doctor’s prescription! Go pro(biotic)! Included in yogurt, these add tons of friendly bacteria into your system. They are almost always recommended for reducing bloating and gas. You can also try adding prebiotics into your diet. Found in foods like apple cider vinegar, these act as food for your gut flora. Together, the pro and prebiotics will get your gut bacteria back into action. And your farting back to normal! Yeah, drinks taste better when carbonated. Even when it’s just plain ol’ water. But all that extra air (mostly carbon dioxide) needs to come out somehow. So don’t be surprised when you start popping like the bubbles in your drink. And beer is the worst. It is the most carbonated alcoholic drink and full of high glycemic carbohydrates. These definitely have a (negative) effect on your digestive system. These fizzy drinks might not be the biggest cause of your problems. But they’re definitely one of the easiest to cut out of your life and replace with others. Flat beverages can be just as tasty. Without all the nasty side effects. And if you love your carbonated drinks, try limiting yourself to one drink per day. Make sure you sip slowly and without a straw too. This will keep the air intake and farting rate as low as possible. Some people are naturally fast eaters who inhale their food. Others are forced to eat fast. Thanks to the non-existent lunch break in our busy schedule. If you have any time to spare, slow down! Chew your food more deliberately and take a few extra minutes before swallowing. Truly enjoy your meal! Plus, eating slowly has been found to help you lose weight. So what’s there to lose? Other than a few farts, that is. Gum has a few other health benefits. But controlling your farts is just another reason to quit smoking. You’re stressed about excessive and smelly farts. Which makes you fart more. Which makes you stress more. Because the gastrointestinal tract is unfortunately interconnected with your hormones. This means that painful farts is actually on the list of physical symptoms due to stress and anxiety. This probably explains why you get the urge to let it rip right before something nerve-racking. To make things worse, the tension can make you swallow more air too. And you might experience much more than farts. When stressed, your body releases acid into the stomach. Chronic stress can lead to diarrhea and vomiting. Yikes! Discovering all this just might make you even more stressed! First talk to a doctor (primary physician or gastroenterologist) for some checkups. While you can test if something in your diet is messing with you, it’s harder with something like stress. If they don’t determine any organic causes, you can work on de-stressing. Meditating and/or practicing yoga once a day go great lengths in helping you relax. The practice gives you time to reflect, plan. Connect with your inner self and surroundings. There are much more benefits too. Find out why you are nervous. If it stems from a fear of public speaking, practice more. Or consider taking a class on it. If you are suffering from anxiety, you can get professional help as well. As you’ll see from this and the next point, everything bad is sometimes all interconnected. For example, eating a fiber-rich diet can lead to constipation and farting. Constipation can also be the reason why you can’t stop farting. Constipation means you can’t readily eliminate wastes from your body. So the feces sits in the bottom of your colon. This is a contributing factor of flatulence. Laxatives are a quick solution. But they’re definitely not that great in the long run. Of course, if you suspect your farting is a sign of something serious, don’t hesitate to seek professional help. The aforementioned diseases (constipation, IBS, Crohn’s disease, celiac disease) result in your body being unable to absorb food. If left untreated, your body will not absorb sufficient nutrients. Most above solutions were on the stuff you can’t have in your diet anymore. Get rid of this! Get rid of that! Even though they’re important to your body for different reasons! Is there that you can eat and drink? That is obviously a rhetorical question. Getting advice from physicians is definitely more recommended. But some home remedies will help change your lifestyle for the better and boost your overall health. Plus, they are great alternatives for those that don’t have the means to see a doctor. So, to answer your question of what you can eat and drink, read on. Herbal tea soothes your tummy and helps manage bowel movements. It also works to decrease gas production. Which of course, leads to less trumpeting sounds coming out of you. You can buy bits of different teas, as they all have slightly unique functions. For example, green tea is famous for helping you lose weight. Chinese pu’er tea helps with digesting large amounts of food. And oolong breaks down greasy, oily foods. Here is a simple and natural herbal mixture to try. This tea will soothe your angry digestive system. Chamomile is known for calming an upset stomach. German chamomile has been approved by the German governmental organization for fighting stomach cramps. The herb aids with sleep too, which can help you de-stress. Peppermint, on the other hand, calms indigestion, irritable bowel syndrome (IBS) and depression-related anxiety. In fact, many studies (published in the British Medical Journal and Mymensingh Medical Journal) conclude that doctors should recommend peppermint for treating IBS. You can find the ingredients in your local supermarket. If not, try an herbal store or search online. For best results, make sure you have at least 1 ounce of all ingredients. But the amount doesn’t really matter. As long as they are all equal. Mix until the ingredients are combined well. Store in an airtight container. When you are ready for tea, spoon the herbal mixture into a teacup. The amount depends entirely on your personal taste. However, one teaspoon should be just right. Pour boiling water into the cup. Let the tea steep for around 10 minutes. Then sit back, take a sip and relax! If you don’t like all the floating stuff, you can strain the herbs. However, it’s not needed. This gentle tea works to reduce bloating that you may experience. Yarrow is an herb with a long history. It helps fight infections, fight bacteria and promote digestion. Other than in tea, you can eat the leaves raw or cooked. You can even add them to salads for a unique pop of flavor! As with before, make sure you have equal amounts of both ingredients. The recommended amount is 1.5 ounces of each. After pouring boiling water over the herbal mixture, let it steep for 5 minutes before enjoying. This tea is most effective after a full meal. Feelings of food comas come when your bowels are moving slowly. The herbs in this tea will give your digestive system a gentle boost so you can stop farting. So we know how easily food is broken down seriously affects our rate of farting. However, many people (especially women) don’t produce enough digestive enzymes. Insufficient enzyme production can be due to stressed, damaged gut lining and more. The undigested food sits in your body. As your gut bacteria have their way with it, they produce gaseous wastes. The toxins can lead to further damage of your gut lining. It can cause the trio: excess give, constipation and bloating. Enzyme supplements help alleviate this problem. If you have enough of them, you’d be able to take on difficult foods like fiber and starch. You can find over-the-counter enzyme supplements at your local pharmacy. They should be available online as well. Some natural enzymes are papain and bromelain. Rich sources of these are papayas and pineapples, respectively. The easiest way to eat these is to simply slice them up and eat raw. Fruit slices work best when eaten before a meal that is high in protein (around 15 to 30 minutes before your meal). You can get into the habit of enjoying more fruity snacks and less farty days. You can also try your hand at these two recipes. While papaya works on digestion, ginger and mint help with your upset tummy. The yogurt included also gives you the probiotics you’re looking for. All you have to do is to throw everything into a blender. And blend away! For a thinner consistency, add more ice. Blend it all together using a blender at the highest speed. You can add a lemon or lime slice for garnishing before serving. If you’re not used to the taste of ginger, start with smaller amounts. You can also add mint for a bigger digestion boost and a delicious touch of flavor. A handful of spinach can increase the nutrition in the smoothie too. The main thing regarding fiber is that it can’t be digested. When you get too much of it, indigestion is what happens. But when you eat just enough fiber, it helps clean your digestive tract. It binds toxins and cholesterol to the waste matter. This helps cleanse your colon and push out the poop. Some great seeds that are packed with fiber are chia seeds and flaxseeds. In fact, they are so full of it that a few tablespoons get you as much fiber as cups of oatmeal. So, be careful not to overeat! It helps to drink a lot of water too. first. If you have diverticulosis, definitely stay away from chia seeds and flaxseeds. After getting your hand on some seeds, you can use them to top practically everything—salads, yogurt, smoothies, cereal . . . the list goes on! Other than soluble fiber, these flax seeds are also a magnificent source of omega-3 fatty acids. This is a healthy type of fat that is anti-inflammatory. The oils in the seeds lubricate your GI system too. Important! You should never eat whole flaxseeds. They’ll just pass through and you’ll be pooping out whole seeds. To benefit from the fiber, you must grind them up beforehand. Since the seeds contain oil, make sure you refrigerate them. Otherwise, they’ll go rancid fast. You’ll know when they have a bitter taste. Mix the flaxseed meal, water and egg together in a bowl. Microwave this for around 45 seconds. Push the pudding towards the center and fold in any add-ons. Microwave again for around 1 minute. The duration depends on what you mix in. Frozen fruits will take much longer. Take the bowl out of the microwave and stir. And then enjoy! The fine line between chia seeds causing and curing constipation all lies in how you eat it. Make sure you start slowly. Eat smaller portions in the beginning. Soak the seeds in water before you consume them. And make sure you reach your daily requirement for water too! Combine the chia seeds, milk, sweetener and vanilla together in a bowl. When the pudding is well mixed, let it sit for 5 minutes. Return to stir and break up any chia seed clumps. Cover the bowl and leave in the fridge for 1 to 2 hours so it can set. When serving, divide the mixture into two servings. (Of course, you can always enjoy it by yourself!) Top with your berries and you are good to go. You can also use a mason jar. Instead of stirring, put the lid on and shake to mix. The recipe we have here is the most basic chia seed pudding. You can experiment and create your own unique variation. For example, adding unsweetened cocoa powder for a chocolate chia seed pudding. Here’s a solution that doesn’t include eating. When your digestive meridians—such as stomach, intestines and colon—are blocked, you will experience excessive flatulence. Bloating and gassiness is common. Shiatsu massage is an ancient Japanese art. 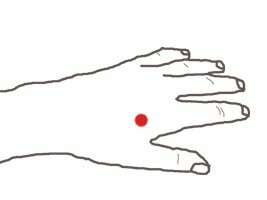 The name translates to “finger pressure.” Through the gentle massage, your chi (life energy) is put into harmony. This balances your body to prevent issues, such as digestive disorders. Like Chinese acupuncture, this type of massage stimulates pressure points along these meridians. Unblocking them will relieve you of your headache-inducing farts. Find a suitable position while massaging. Your comfort is key in letting shiatsu do its job of helping you stop farting. This point is on your outer arm, just above the elbow crease. Use your thumb to locate it. Then press down and hold it for at least 1 minute before releasing. Stimulating this will relieve diarrhea, constipation and other abdominal pains. 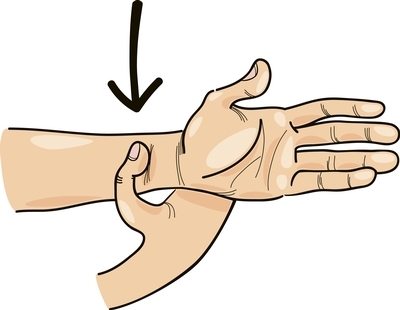 The point on your inner forearm, below the joint will help with excess gas. 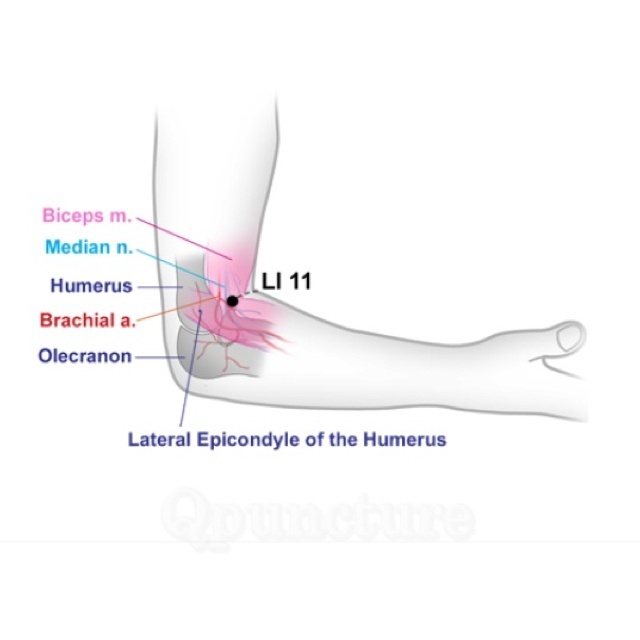 This point is located in the middle of your forearm. It is three fingers’ width above the wrist. Press down as before to relieve indigestion and stomach aches. The inner gate can also soothe anxiety! This pressure point is on the outer edge of your leg. It’s around three fingers’ width below your knee. To stimulate it, be seated with your feet flat on the ground. Your knees should bend at a 90 degree angle. Place all fingertips of one hand (minus the thumb) just below the corresponding kneecap. The small indentation where your pinkie falls is the pressure point. Press down to relieve bloating and flatulence. This is a major pressure point on your feet. Find it by first crossing one foot over the opposite leg while sitting. Use your thumb to locate the point. It is in the webbing between the first and second toe, where the bones of the toes meet. Pressing on it will balance and stimulate your gallbladder. This helps eliminate gas and abdominal pains. A point on the base between the second and third toes also help do the same. This pressure point helps you stop farting by reliving colitis and diseases in the lower abdomen. It is three finger widths’ above your ankle bone. Gently press down with the flat of your thumb for 1 minute to enjoy the benefits. This is on the side of your foot’s arch, around 1 finger’s width from your heel. If you start measuring from your big toe, it’s 4 fingers’ width away. The grandfather-grandson pressure point balances your stomach. It relieves indigestion by harmonizing energy flow. It also stimulates circulation through your entire body. The last pressure point helps stop nausea. In addition, it can relieve constipation and diarrhea. Place the flat of your thumb on the webbing between the index and thumb of the other hand. Press gently and hold for 1 minute. This stimulates and unblocks the meridian of the large intestine. Doing so will improve intestinal functions all around. If a certain food is the culprit responsible for your gassiness, consider activated charcoal capsules. This type of highly porous charcoal is usually made from coconut shells or bamboo. Thousands upon thousands of tiny pores are on the surface. This allows the carbon to electrostatically sponge up the gases and toxins inside you. Because the toxins in your GI tract mostly have a positive charge. While the activated carbon is strongly negative. After absorbing the toxic gases, the activated carbon traps them. It makes things easier to eliminate these gases. The charcoal acts like a mini vacuum inside your digestive system. Because of how powerful it is, make sure to take activated carbon with water, on an empty stomach. It should be far, far away from meals, medications and supplements. Like the chia seeds and flaxseeds, the charcoal can interfere with nutrient absorption. It’s highly recommended to discuss with your physician before deciding on activated carbon. Then wait at least 1 hour before breakfast. It is the same during the rest of the day. Consume the carbon at least 1 hour before eating or taking medicine. And at least 2 hours after a meal or medication. Eating foods that are difficult to digest will cause a buildup of gas. Since bacteria will be used to break down the food. And noxious gas is the byproduct. Or the food ferments in your gut. Leading gas to build up as well. These include, but aren’t limited to: starches, fiber, dairy (especially if lactose intolerant), artificial sugar substitutes. To solve this problem, keep a food diary for a while. Then go 1 week without eating the food you think may be responsible. See if the farting goes away. You can then slowly reintroduce the food back into your diet. Or cut it out your diet entirely. You may have an imbalance of gut flora in your colon. To fight the “bad guys,” make sure you get a healthy dosage of probiotics. Pickled vegetables, yogurt, kefir and other fermented foods are great choices. If these supplements aren’t enough, you can take an extra step. Lactic acid yeast wafers restore friendly bacteria in your bowels. Habits such as chewing gum, drinking carbonated drinks (such as soda or alcohol) and smoking forces you to take in more air than usual. The CO2 gets trapped in your esophagus and/or stomach. If it gets to your intestines, there’s only one path out to take. In addition, remember to eat and chew slowly when you can afford it. Exercise regularly too! Your mental health may be affecting your physical body. Practice yoga and drink tea to relax and strengthen your mind. You can also visit experts for professional help. Flatulence, constipation and irritable bowel syndrome are all closely linked. Many solutions will target them all. But if your case is too serious, make sure to see a doctor. The bottom line is that farting is totally normal. They are impossible to get rid of entirely. But you can control and reduce your rate and smelliness. Letting one rip may be a sign of something more serious. But usually, there are only minor physical dangers. And hopefully this article will help you decreases chances of public embarrassment. We know fart jokes are funny. But let’s hope it will never happen to you again!